Cricket T20 Cricket live score, India vs Ireland 1st t20 live updates. 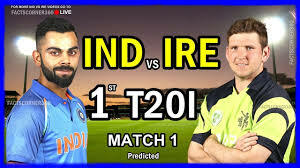 Cricket live score, India vs Ireland 1st t20 live updates. India vs Ireland 1st t20 match being played in The Village, Dublin on 27th Jun 2018. Match started at 8pm IST. Ireland won the toss and opt to bowl first. Rohit Sharma and Shikhar Dhawan started the inning for India. Both players crossed half-century. Shikhar Dhawan scored 74 with 5 4s and 5 6s. India 168/1 in 16.2 overs. Suresh Rains scored 10 off 6 bowls. To hit Sharma remained 3 runs short from his century. He scored 97 off 61 with 8 4s and 5 6s. India 208/5 in 20 overs. India lost 3 wickets in last over the wickets of MS Dhoni 11, Virat Kohli 0 and Rohit Sharma 97. Peter Chase of Ireland got 4 wickets in his 4 overs spell. Kevin O Brien got 1 wicket. Ireland started the inning to chase 208 runs but could score only 132 runs in 20 overs for the loss of 9 wickets. Kuldeep Yadav got 4 wickets for 21 runs in his 4 overs spell including 1 Maiden also. He was declared Man of the Match. Only Paul Stirling played a great inning for Ireland, 60 off 35 delivery with 5 4s and 4 6s. S Thompson 12, A Balbirnie 11 and K O Brien 10, were only the players who scored in double figure. So India won this India vs Ireland 1st t20 match by 76 runs.